The KAPATIRAN is the official website of the Brotherhood of Christian Businessmen and Professionals. with Editorial and Business office address at: BCBP National Office, Unit 416 Comfoods Bldg, Sen. Gil J. Puyat cor Chino Roces Aves., Makati City 1200, Metro Manila, Philippines, with tel. 819-0052 and fax no. 819-0051. The KAPATIRAN provides a channel for the flow of INFORMATION from the BCBP national level to BCBP regional, chapter and member levels, and between chapters – and vice versa – to help members keep up-to-date with relevant happenings and policies in the BCBP nationwide. By keeping everyone informed of what and how others are doing, the KAPATIRAN encourages and provides opportunities for linkages and closer communication. As the official media vehicle of the BCBP, it also serves a historical purpose since they help document the development of the BCBP over the years. The KAPATIRAN strives to be a source of INSPIRATION to both members and non-members through the publication of sharings, inspiring articles and features. They serve as a vehicle for the FORMATION of members through “Back to Basics” and “Formation” articles and other features and teaching articles that highlight important aspects of the BCBP member’s Christian Way of Life. The KAPATIRAN also provides supplemental material to help chapters and outreaches develop powerful talks based on the BCBP formation curriculum, and to stimulate relevant action group discussions and activities. 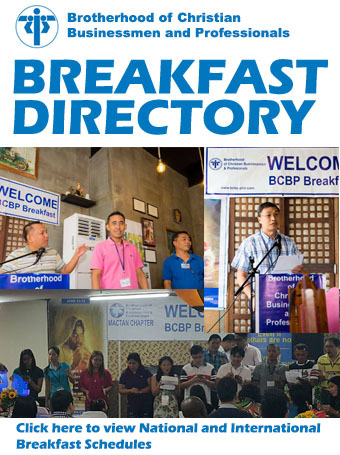 The KAPATIRAN is designed to help members EVANGELIZE and reach out to others by providing an attractive and interesting, quality internet site that espouses BCBP’s mission and values as it introduces the BCBP Way of Life to those interested, to first-timers in the BCBP Breakfasts, to business friends and associates, and to web surfers, making it a valuable tool for evangelizing the marketplace. The website’s content also strengthens the BCBP Way of Life for members. 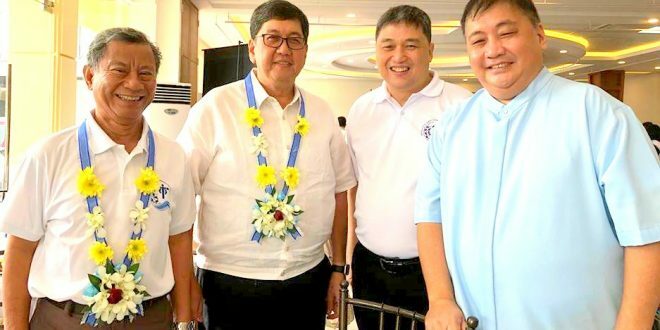 The KAPATIRAN helps UNIFY and HARMONIZE BCBP chapters and outreaches by directing the members’ focus on the BCBP as a recognized national organization, not just a town-based, parish-based, provincial, or regional organization. Contributions of articles, feature stories, items of general interest are encouraged and shall be subject to editing and selection. We especially welcome life testimonies and sharings of marketplace victories from BCBP members. We also appreciate reader comments and feedback in the spaces provided at the end of every article/sharing/column. All material and pictures submitted, accepted and published become the sole property of the BCBP and may be used as needed by the BCBP. Since the BCBP is a non-profit organization, authors, writers and contributors do not receive any remuneration for their submissions, whether published or not. Contributions should not exceed 2000 words, with the manuscript indicating source (if any, other than the contributor), author’s name, address, and contact number. BCBP members should indicate their chapter affiliation. If the article comes from a copyrighted published source, permission to use must be obtained from its original author/source. Anonymous contributions may not be accepted. All material and contributions should be emailed to The Editor at junep.ocampo@gmail.com or to the BCBP National Office, attn KAPATIRAN Editor. All contributions and material will be edited in terms of content, length and adherence to the BCBP values and BCBP culture. Any opinions expressed in contributed material are the author’s own and are not to be considered official BCBP statements. If major revisions are indicated, the edited version will be returned to the contributor for approval, otherwise it may be deemed acceptable for publication with any necessary minor revisions. All material will be subject to final approval by the KAPATIRAN’s Editorial Board before publication. ▪ I will pray every day for at least 15 minutes and intercede daily for the BCBP. ▪ I will participate regularly in the worship life of the Church. ▪ I will avoid serious sin and wrongdoing. ▪ I will put good order into my private and family life and in all my relationships. ▪ I will regularly attend the BCBP Breakfast. ▪ I commit to love and support the members of my action group. general assemblies, in the chapter, in the unit and action group I belong to. talents and resources that God has given me. BCBP Breakfast and the BCBP Christian Life Program. ▪ I will wholeheartedly support my spouse in our covenant to the BCBP. ▪ I commit to professional excellence in my work. ▪ I will be a role model and a Christian witness in the marketplace. within the company, as far as my authority will allow me. • I will pray every day for at least 15 minutes and intercede daily for the BCBP. • I will read Scriptures every day for at least 15 minutes. • I will participate regularly in the worship life of the Church. • I will avoid serious sin and wrongdoings. • I will put good order into my personal and family life and in all my relationships. • I will wholeheartedly support my spouse in our covenant to the BCBP. • I will regularly attend the BCBP Breakfast. the Lord is doing in my life. • I commit to love and support the members of my action group. • I will faithfully and punctually attend and participate actively in all BCBP activities. • I will regularly tithe and share the time, talents and resources that God has generously given me. • I will follow the directives of those who have responsibility over my service. honesty, integrity, and justice in all my business and professional dealings. • I commit to professional excellence in my work. • I will be a role model and a Christian witness in the marketplace. • I will conduct my business according to God’s principles and oppose evil in the marketplace. the company, as far as my authority will allow me. contractual obligations to private creditors and companies I deal with. Pls make the necessary corrections. I am interested to join the breakfast meetings and be part of your community. I went to the former venue at Spoon Restaurant here in Binan Laguna but it is not there anymore. May I know where can I attend nearest to my Binan home. I am a risk management professional and businessman with a risk consulting firm with office in West Avenue Quezon City. I wish there is a venue I can attend during weekends here in Binan. May I ask where is BCBP ‘s nearest chapter in Ortigas that meets on weekdays and in Binan Laguna that meets on a weekday and where they meet? I want to join your brotherhood.